Led by Professor Neil Foster from the WA School of Mines: Minerals, Energy and Chemical Engineering, the technology is expected to impact medication delivery for diseases like irritable bowel disease, colorectal cancer, tuberculosis, cystic fibrosis and lung cancer, which are currently associated with “inefficient, often complex and time-consuming” treatment that contribute to poor patient compliance, according to Foster. The Atomised Rapid Injection for Solvent Extraction (ARISE) technology re-engineers active pharmaceutical ingredients into particles no larger than a few micrometres, which means they can be more easily absorbed into the bloodstream than conventional pharmaceutical drugs. This means a lower drug burden on patients’ bodies, associated side effects and ultimately, costs. Foster and his team have already tested the delivery system on insulin, fluorouracil (which treats cancer), tobramycin (for bacterial infections) and the antibiotic, fosfomycin. This testing saw an increase in efficacy on these medications, according to Curtin University. And the technology has the potential to reduce the cost of developing and gaining market approval for a new prescription medicine, which is estimated to be around US$2.6 billion. In the next 12-18 months, the team is anticipating an increase in production to 100g of material a day. Foster said this could prove to pharmaceutical companies that the methodology works on an acceptable scale. The way it works is ARISE exploits the properties of supercritical fluids and gas expanded liquid technology. Supercritical fluids are substances where pressure and temperature are above critical values, making it a gas and a liquid. The gas-like properties enable it to penetrate into a product and the liquid-like properties enable it to dissolve materials within, allowing for easy extraction. However, most pharmaceuticals can’t dissolve in supercritical fluids, such as supercritical fluid carbon dioxide (CO2), so there’s an extra step involved where the pharmaceuticals are dissolved in a solvent like as ethanol before the supercritical fluid is added, according to Foster. “As the CO2 is added, the solution physically expands. As the solution expands, the density, and therefore dissolving power, decreases,” he explained. “At a certain degree of expansion, the solution no longer has sufficient dissolving power to hold onto the pharmaceutical. What we then see is spontaneous crystallisation of the pharmaceutical out of the expanded solution: a gas expanded solution. The pharmaceutical has a very small particle size, typically five micrometres and less, down to 50 nanometres, which is good for increasing solubility of the drug in the bloodstream, according to Foster. And the distribution of particle sizes is very narrow, which is better to predict the onset of the therapeutic effect. 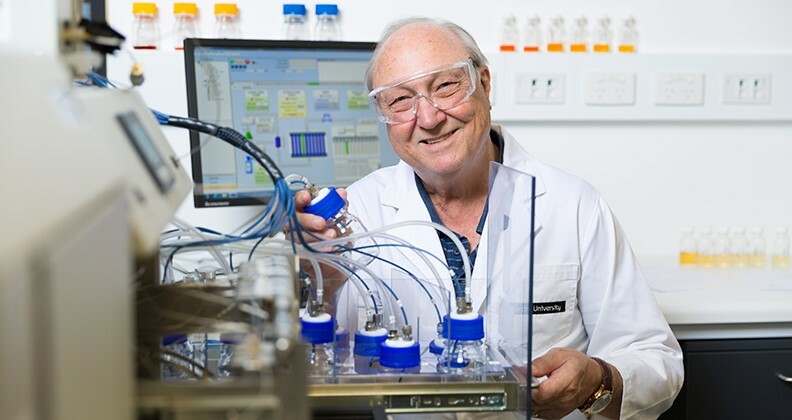 Image: Prof Neil Foster, courtesy of Curtin University. Photographer: Sam Proctor.